To say thank you for all your kind support and to welcome in the spring, which feels like it may be on the way, the elves have prepared a little giveaway of this overalls set. To enter the draw all you have to do is leave a comment at the end of this post and on Saturday 19th March I will draw the winners. You will need to check back here or on the moshi-moshi Facebook page later. Good luck! I will draw the winner using random.org on the 19th March at 5pm (UK time). Oooh! Thank you for the giveaway! Absolutely adorable! Thank you for the chance. Oh man, I love this set!!! I love your doll clothes, Hilary! Whoever wins is very lucky! Oh what a nice gift, thank you. Thank you so much for this ��. I love everything you create. This is just adorable!! Thank you very much this is very kind. I would like to play please. I hope I win. I'd love this for my Blythe. Would love to win this fabulous set. Thank you for such a generous giveaway.. I love this set❤️ Thank you for such an awesome giveaway! Oh love your clothes. so hope to win. Thanks to you and kisses for the moshi-elves! Thanks for your generosity, Hilary! Very kind of you. We love your little creations! please, please. pretty please. Thank you for making adorable Blythe clothes! Oh! I love this! Thank you for being so kind! Love your sewing very much Hilary! Thank you to being so generous! Marcos. Second try to commend: Oh, what a lovely overall set, dear Hilary! This set is so lovely! Thanks for this giveaway! 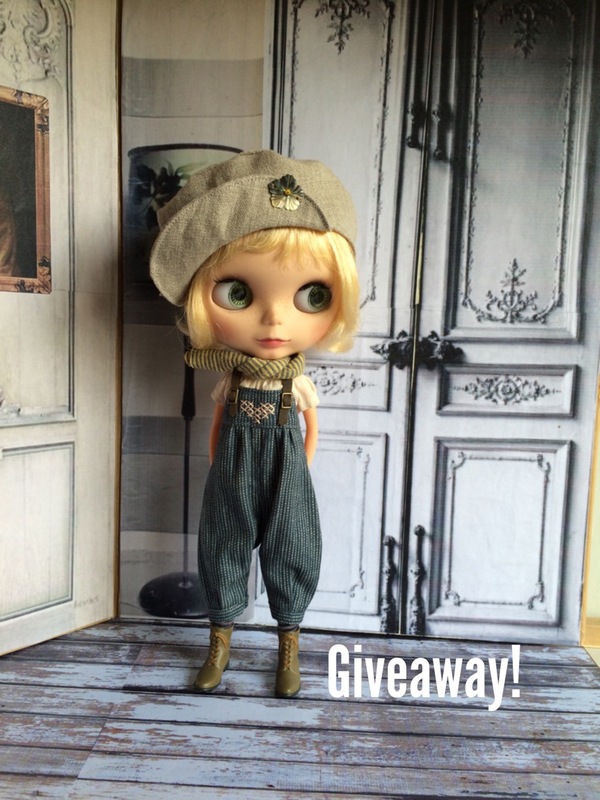 Thanks for the chance to win this cute outfit for my dolls. Lovely set, can't wait to get my moshi collection started! Awesome, the best giveaway ever! Thanks Hilary! Good luck everyone! That is a great giveaway !!! Thank you Hilary, this outfit is marvellous. Thanks for being so generous Hilary :) Lovely giveaway! I've only just scored an outfit from you and love it! I'd certainly love another! Thank you. OMG ! A chance to catch one of your amazing clothes !! I cross my finger ! Ohhh that's great Hilary!!! Love this set!! Thank you and thanks to the elves!!! Thank you so much. Good luck everyone. Oh thanks so much for the chance! This set is the cutest! Thank you so much for the chance to win one of your marvelous sets! I love your work! Thanks for giveway!!! Ooooo what a lovely overall, thank you so much for this giveaway. Good luck to all! What a wonderful way to say thank you! Thank you. Such a lovely outfit. Thank you for doing this giveaway. Your work is the best and my dolls look the best in it. Oooh! Thank you for this giveaway! Thank you for this opportunity! I adore your work! Oh please, please, please, please, please! :D These overalls are gorgeous and I love your creations! - I have bought some secondhand, but never directly from you (always too slow!). Good luck everyone, fingers crossed til Saturday! Ohhhhhh that's so kind of you to gives us this chance <3 Your work is always so gorgeous! Adorable! Many thanks. Congratulations for your good work with the needle!! Coool!! Thank you for this chance! What beautiful clothes you make! These are no exception, I'm still trying to make something worthy of my girls. I'm sure they'd look great in them! I love your style. Thanks for the giveaway, someone will be lucky to get this set, it's so cute! How very sweet!! Thank you so much!! This is so sweet! Thanks! Ooh how lovely. They look fab.